29th day of the year with 336 days to follow (337 in leap years). 1861 Kansas is admitted as the 34th U.S. state. 1886 Karl Benz patents the first successful gasoline-driven automobile. 1891 Liliuokalani is proclaimed Queen of Hawaii, its last monarch. 1900 The American League is organized in Philadelphia, Pennsylvania with 8 founding teams. 1907 Charles Curtis of Kansas becomes the first Native American U.S. Senator. 1943 The first day of the Battle of Rennell Island, U.S. cruiser Chicago is torpedoed and heavily damaged by Japanese bombers. 1985 Final recording session of We Are The World, by the supergroup USA for Africa. 1998 In Birmingham, Alabama, a bomb explodes at an abortion clinic, killing one and severely wounding another. Serial bomber Eric Robert Rudolph is suspected as the culprit. 2002 In his State of the Union Address, President George W. Bush describes “regimes that sponsor terror” as an Axis of Evil, in which he includes Iraq, Iran and North Korea. 2009 Governor of Illinois Rod Blagojevich is removed from office following his conviction of several corruption charges, including the alleged solicitation of personal benefit in exchange for an appointment to the U.S. Senate as a replacement for then-U.S. president-elect Barack Obama. 2015 Malaysia officially declared the disappearance of missing Malaysia Airlines flight MH370 an accident and its passengers and crew presumed dead. A lawyer awoke in a hospital bed after a complicated operation, and found that the curtains were drawn around him. ONE-LINERS: What “Really” Means When a Guy Uses It. . .
A nursery school teacher was delivering a minivan full of kids home one day when a fire truck zoomed past. Sitting in the front seat of the fire truck was a Dalmatian dog. The children fell to discussing the dog’s duties. ~ “Just how big were those two beers? pic of the day: Rufous Hummingbird.. Teacher: Vincent, not to be presumptuous, but your short story is truly fantastic. Did you really write it? Vincent: Yes, I wrote, while my mother dictated.. Turns out, his boss got sick and tired of him. ~ How many Kings of Spain does it take to screw in a light bulb? In a criminal justice system based on 12 individuals not smart enough to get out of jury duty, here is a jury of which to be proud. TODAY IN TRIVIA: How did the monkey wrench get its name? The monkey wrench is named after its inventor, a London blacksmith named Charles Moncke. ~ How do hedgehogs protect themselves? Hedgehog quills are not barbed or poisonous. Hedgehogs do apply a foamy, foul-tasting saliva to their quills, which protects the animals from predators. ~ Which is the feistiest hummingbird in North America? The brilliant orange male and the green-and-orange female Rufous Hummingbird are relentless attackers at flowers and feeders, going after (if not always defeating) even the large hummingbirds of the Southwest, which can be double their weight. ~ Does Alaska have hummingbirds? 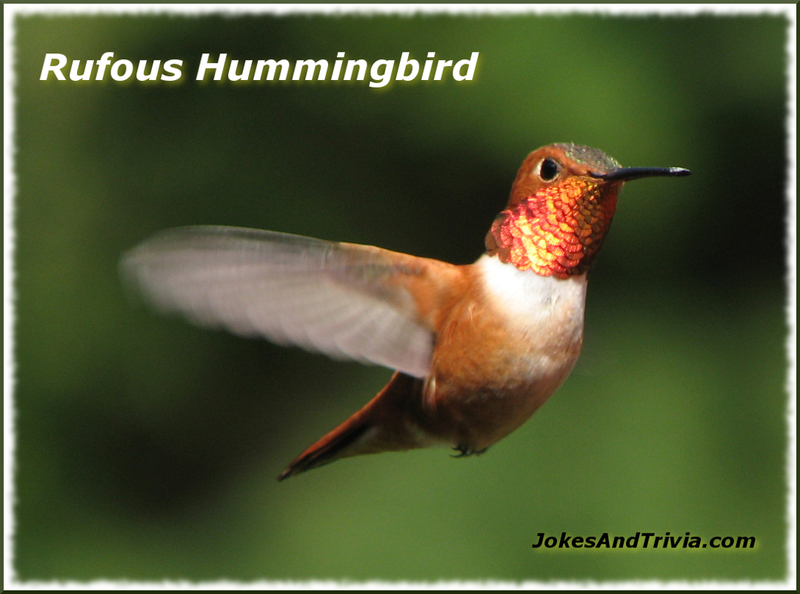 The Rufous is the only species of hummingbird to nest in Alaska. They migrate 2,000 miles to Mexico each winter, and then back to Alaska in the spring. ~ What color is a Rufous Hummingbird? In good light, male Rufous Hummingbirds glow like coals: bright orange on the back and belly, with a vivid iridescent-red throat. Females are green above with rufous-washed flanks, rufous patches in the green tail, and often a spot of orange in the throat. Lovely, crystal clear video showing the bright colors of a Rufous Hummingbird. . .
QUIP OF THE DAY: Don’t give up on your dreams. Keep sleeping.